A relatively young city, Chesapeake was formed in 1963 as a consolidation of a large part of Norfolk County and the city of South Norfolk. Chesapeake is classified as an ‘independent city’, being free of any connection to a particular county. 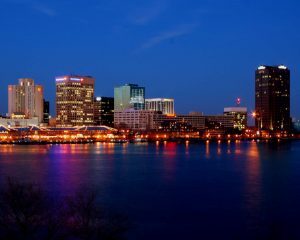 Historically, the city of Chesapeake has a strong connection to America’s colonial past, with the original settlement of the area dating back to around 1691. Today, Chesapeake has a population of around 230,000 residents and covers a very large geographical area of almost 350 square miles. With a population density of around 650 residents per square mile, Chesapeake is mostly comprised of suburban and rural areas, as well as wetlands, forests and swamps. These factors combine to make an ideal environment for the proliferation of various pest populations. Belonging to the ‘humid subtropical’ climate zone, the climate of Chesapeake is characterized by hot, humid summers and mild, if cool winters. Precipitation in the area is moderately high, with the annual average standing at a little under 50 inches per year, and summer generally being the wettest season. These factors combine to make the hotter and wetter summer months generally the most volatile in terms of pest activity. Being home to a significant number of waterfront properties, Chesapeake residents are particularly vulnerable to aquatic pests. These can include mosquitoes and horse flies. These pests can be particularly troublesome during the warm summer months, when they are most active. Although both types of insects are both capable of transmitting dangerous blood-borne diseases, such occurrences are rather rare in the US where they are typically proven to be a chronic annoyance rather than a serious health threat. These pests are generally not an indoor problem since windows and doors are normally kept tightly closed and air conditioning is used. If mosquitoes or horse flies are a particular problem near a given residence, it can be worth taking measures to try and control the swarming population. Both are very difficult to control, and elimination is almost impossible through DIY methods. Instead, it is best to take steps that will dissuade them from biting their human victims. Both pests are attracted to dark clothes and some perfumes. It is advisable to limiting the use of both of these during peak pest season. Additionally, high strength insect repellent is generally efficient in driving away pests. Although they have limited effectiveness in completely eliminating aquatic insect pest problems, chemical spraying can produce some short-term results for the treatment of severe mosquito or horsefly problems. In these cases, it is recommended to contact a certified pest control agent for advice on how to treat the problem. There are a number of certified pest control agencies servicing the Chesapeake area that can assist with controlling aquatic insects, as well as more standard varieties of household pests. These include HomePro Pest Control, Accurid Pest Solutions and Fox Pest Control.